Don’t blame Facebook. If you are not as successful as you wish, you are probably making one of these mistakes. Many healthcare marketers have now created Facebook pages but are seeing varying degrees of success. And it’s perplexing. Ad Age published an article written by Paul Dunnay that listed 10 reasons why your Facebook strategy could be failing. He makes some excellent points, all of which are worth sharing. Perhaps the suggestions can help us have more successful Facebook pages. The article is republished here in its entirety. So, you’re one of the seemingly millions of brands out there using Facebook to lure people over to your website. Chances are you’ve viewed recent reports about Facebook’s surprisingly low activity rates (“Only 1% of people who like a Facebook page ever go back to that page”) as vindication of what you’ve always suspected: marketing on Facebook just doesn’t work. 1. You made a bad first impression. Most fans won’t ever come back to a brand’s page unless they feel they have good reason to. This is not totally different from how they interact with their friends’ pages when you think about it. Unless the new friend has great content to go back to, there’s not much of a reason to go directly to their page very often, if at all. 2. Your copy and visuals are boring. A successful Facebook page must have concise, engaging text that’s relevant to both the brand and the fans’ interests. Overly long, humdrum copy will fail to capture fans’ attention. Crisp, eye-catching, high-resolution visuals (photos, videos, illustrations) that clearly speak to those things visitors like about the brand in the first place will draw them in for more. 3. Your content is stale. If fans stop by more than once only to find the same old Facebook page, they might assume the page is outdated — or worse, abandoned. It’s important for marketers to give fans new ways to connect and advance their relationship with the brand or product being promoted. Keep to a consistent schedule with fresh content and ever-improving offers, and be sure to test what works with your audience. 4. Inconsistent or lazy branding. If there’s no stylistic connection between a company’s Facebook page and its main website, visitors may not trust that the page is legit. Brands often spend a disproportionate amount of time, money and effort on website branding efforts, in comparison to the relative pittance reserved for complementary Facebook efforts. Keep branding consistent across all channels, so that visitors know exactly where they’re going and whom they’re dealing with. 5. Confusing calls to action. Once fans arrive at a brand’s Facebook page, they should have a clear idea of what to do and what’s available to them. Offers and calls-to-action should be prominently displayed, and any associated instructions should be easy to follow. Be aware, however, that Facebook has guidelines concerning calls-to-actions, offers and anything else resembling blatant advertising on company pages, so it’s important to make sure you’re current on usage guidelines. People are impatient—and want immediate gratification—especially on Facebook. If you have to use forms to give visitors access to the content they want, they’re likely to click away. Make sure the desired destination can be reached in the fewest amount of clicks possible. Also, if you have to use a form to capture data, keep it short and simple. 7. You’re treating all your fans the same way. All fans are not alike – so why treat them all the same? With the right tools, marketers can compile profiles using Facebook data authorized by the user (age, gender, location, name, relationship status, etc.) as well as previous site behaviors, to get a better sense of the type of people they’re reaching on Facebook. Those profiles can then be used to present offers, content and/or experiences that are the most effective in attracting fans, “Likes”, website traffic or any other relevant conversion metrics. 8. You’re playing it too safe. As excited as marketers may get about shiny new objects—especially social media objects—they’re often reluctant to spend the time and money to truly develop new efforts for them. Why not step out of your comfort zone and try to develop specific content based on customer segments? An even crazier idea—consider developing Facebook-specific campaigns rather than repurposing ones created with a different platform in mind. If Facebook plugins aren’t integrated into the main company website, a great deal of potential traffic—and revenue—is being lost. Plugin tools turn consumers into brand advocates, making it easy to share site information with Facebook friends. 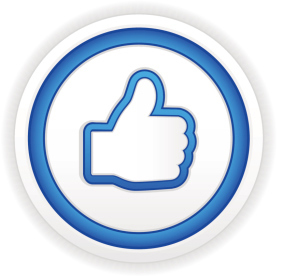 Let visitors like or share website pages back to their Facebook profile with one click. Better yet, provide personalized suggestions to your website visitors, based on what other people are sharing as well as their own click behavior. 10. You’re getting the metrics wrong. Getting just one side of the story isn’t enough. Marketing programs need to be set up so that Facebook stats and user profiles are fully integrated with all other online and offline e-commerce channels’ information to create rich, detailed and fully comprehensive user profiles. Profile reports should be updated on a regular basis, so the most recent user information is always available. With the proper attention to detail and willingness to dedicate the same energy to Facebook efforts as they do to other initiatives, online marketers will no doubt find that their 1% conversion rate is something they can control—and that it’s not Facebook’s fault their customers aren’t more engaged. Paul Dunay is vice president of marketing at Maxymiser.